Make that special someone happy by getting them any one of these gorgeous gifts. I was particularly drawn in by the sleek design of the nail polish bottle, the wide spectrum of colour and the countless finishes available. Another amazing thing about them is that they donate proceeds to organizations that support women.On that note,I’m sold. 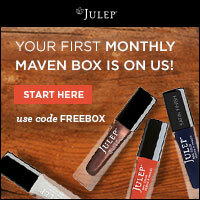 So,will you become a Julep Maven? Read their FAQ to see the fine print including subscription,billing,cancellation,shipping etc .